If you wish to enhance your overall online experience, make sure to bypass a program that goes by the name of SunnyDay-App. In fact, we highly advise you to remove it if it is ever found up and running on your operating system as it provides no actual beneficial features and could even actually prove to be a potentially invasive and malicious application. Unfortunately, according to our reports quite a few users already have this active on their PC mostly because they are misled into obtaining it while holding a belief that it will improve their online experience in various ways. Many users are lead into thinking so because these are the claims that they come across on its official website. In reality, there is the only one thing that should be done about SunnyDay-App, and it is its complete removal. Read the rest of our report and find out why its removal is essential. As soon as SunnyDay-App enters your operating system, you will notice an unusually large amount of third-party web content within your web browser. In the majority of cases, this program will provide you with various third-party ads, coupons, and pop-ups. Unfortunately, none of the presented web content will actually be useful. In reality, the pop-ups, ads, and coupons will only cause numerous interruptions almost every single time you decide to surf the web. At times, you could be presented with so much of unwanted web content that surfing the web could turn out a task that is virtually impossible. All such activity is possible due to one simple system service which is running in the background. It is so because the service in question initiates numerous connections to various adware servers which are the primary source of intrusive third-party web content. Unfortunately, it is a rather tricky task to identify the intrusive system service responsible for the intrusive functionality especially if you are not an advanced computer user. The best and the only way to breakdown these connections entirely and to regain the full functionality of your web browser is by conducting a complete removal of SunnyDay-App. If you fail to do so, your web browser will continue to be filled with various unwanted ads and pop-ups at all times. If all that invasive and annoying activity was not enough, you must be aware of the fact that at times SunnyDay-App could even turn out to be a malicious application. After executing further investigation, our research team has discovered that in some cases this program could present you with ads and pop-ups, which could then prove to be embedded with redirect links. This is a dangerous instance, to say the least since you could be taken to suspicious and even malicious third-party sites by simply clicking on a seemingly harmless ad. On top of that our malware experts have also discovered that in some cases this program could initiate unauthorized connections to the Internet, which could also have detrimental outcomes since, during such connectivity, a silent download could be triggered. It is crucial to highlight the fact that a dubious and even potentially unwanted program could be obtained without your knowledge. It should be more than obvious that SunnyDay-App is a risky program to have fully active on your PC; thus, it is not surprising that our research team recommend conducting a complete removal of this adware as soon as it is located running on your computer. Below we provide a detailed removal guide that should help you terminate SunnyDay-App without encountering major problems. As soon as you are done with the manual removal, we highly advise you to run an in-depth analysis of your PC for potential leftover files or registry entries associated with SunnyDay-App. 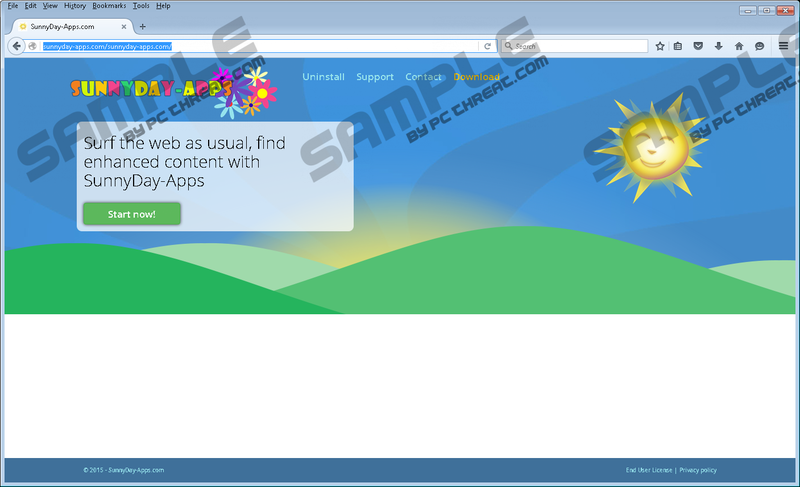 It is important not to leave any traces linked to this adware application since just a few registry entries or files could be more than enough for it to continue its questionable functionality. If you find such analysis too complicated, make sure to check your PC for traces of this ad-supported program with a reliable antimalware tool right after you are done with the manual removal. Select SunnyDay-App and click the Remove button. Quick & tested solution for SunnyDay-App removal.